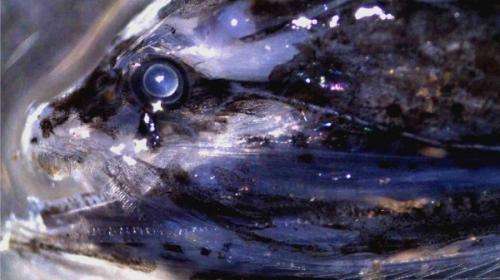 A deep sea fish that is one of the most common vetebrates on the planet has eyesight comparable to a middle-aged human, research suggests. UWA PhD student Tony Kuhar studied the eyes of the veiled anglemouth (Cyclothone microdon), which lives at depths ranging from 200m to 2500m. He found that their eyes had about 69,000 photoreceptors per square millimetre. "That sounds like a lot, but if you compare it to fish like, there's a specific myctophid fish that lives at that depth also, they have something around the number of two million [photoreceptors]," Mr Kuhar says. "It's going to be able to see something but it's not going to have really, really sharp vision." Mr Kuhar says C. microdon has relatively small eyes, where most deep sea fish have large eyes to let as much light in as possible. "But that doesn't mean that they can't see anything," he says. "Their eyes can probably see as well as a middle-aged human being can. "I wouldn't say 20/20 vision, probably a little bit worse than that, but not really requiring glasses as such." Mr Kuhar, who presented the research last month at the UWA Oceans Institute's Oceans Community event, says C. microdon is one of two fish species that are arguably the most abundant on Earth. "They inhabit zones of the ocean like the mesopelagic zone where it is completly dark, there's no natural light, but other other organisms give off what they call bioluminescent point light, so little flashes of light in the distance or close by," he says. "They would be able to pick that green flash up." 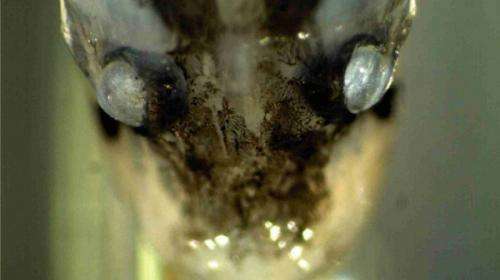 C. microdon begin life as planktonic larvae at the surface and their eyes are developed to pick up light just as human eyes are, Mr Kuhar says. "They migrate down as they get older and as adults they lose the parts of the eye that help them with light vision and maybe even colour," he says. "They lose the cone part of the retina, so they lose all the cones and they're just left with the rod parts, which is what we use to help us with low-light vision." Mr Kuhar also studied the part of C. microdon's brain that processes vision, called the optic tectum, and found that it was quite large. This suggests that the fish relies on its vision more than other senses to hunt for prey, avoid predators and find mates.